The conference was hosted by the National League of Cities (NLC) Institute for Youth, Education, and Families (YEF Institute) in collaboration with the City of Denver and the nonprofit Colorado Youth for a Change (CYC), and was made possible through the Charles Stewart Mott Foundation. According to our friends at the NLC, the number of attendees doubled since last year’s meeting in Boston. We started off with a review of the network objectives and challenges, followed by in in-depth overview of efforts in Denver and surrounding communities Aurora, Boulder Valley, Englewood, and Jefferson County. These districts and organizations are progressive and creative in serving the needs of dropout and disengaging students. Efforts include making phone calls to each student within 24 hours of their dropping out of school, as well as increasing alternative or what we call “multiple pathways to graduation” (MPG) options for students who are returning to school or for whom traditional high school is not a good fit. This may include blended learning (online and classroom), dual-credit programs, settings for younger or older students, flexible scheduling for pregnant/parenting and working students, and enhanced career-focused “GED Plus” options for students for whom a high school diploma is out of reach. Part of developing alternative options is the recognition that MPG programs require different teaching and leadership styles to meet this population’s needs. As Kathryn Boogaard from Denver Public Schools put it, alternative education isn’t a place for students to get “fixed,” it’s a place to go by choice. 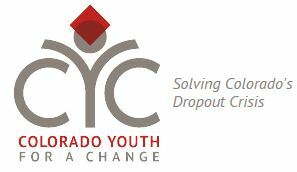 We also heard from Drop In Denver, a collaboration between CYC, Denver Public Schools, the Denver Mayor’s Office of Education and Children, Colorado Public Television and Donnell-Kay Foundation. 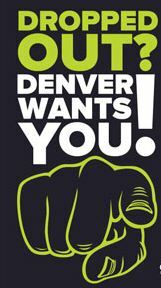 Drop In Denver is a virtual campaign using texting, website and video support (including a PSA from Denver Mayor Michael B. Hancock) along with guerrilla tactics such as stickers and posters to reach out-of-school youth who are ready to re-engage. The Drop In Denver website is interactive and suggests options in real-time according to the student’s answers to five simple questions. Barb: I was inspired by Denver Mayor Michael B. Hancock’s remarks and commitment to making Denver a city “where everyone matters” including youth who have become disengaged from school and “deserve another chance.” His belief that the community is responsible for what occurs on the “other side of the school door” really resonated with me. It was interesting to hear how Denver and other communities are utilizing citywide campaigns to reach disengaged youth and create public awareness about the need for options. Greg: I thought it was interesting how the nonprofit Colorado Youth for a Change is notified by school districts they are working with every time a youth drops out of high school. Within 72 hours they try to make a contact with the youth to open the door to reengagement. They also have a website where dropout youth can go online through a step-by-step virtual reengagement—pretty cool! Carolyn: I liked seeing the varied alternative options available for students in the Denver area as well as the collaboration between school districts, city government, and nonprofit organizations to re-engage students — seeing this in action was encouraging. Like last year, I also enjoyed the chance to learn from and share ideas with the staff of other re-engagement centers, some that have been in operation for years and some that aren’t even open yet. See photos from the event on our Facebook page. For more coverage, please see the pre-meeting blog post from the YEF Institute’s Andrew Moore and YEF Institute Executive Director Clifford M. Johnson’s recap of the event.